July babies. Both my girls have come in the heat of the summer. Their rumblings will forever be tied to clammy nights under the steady breeze of a fan, to walks on heated pavement ambling from shade to shade; the slow avalanche of their births both begun on heady evenings when the sun had only just blinked to dark. Boston is drifting under a week-long heatwave right now. I do so love these cooped up mornings: no expectation of leaving the apartment, the windows closed to the heat and one or two air conditioner units humming away. 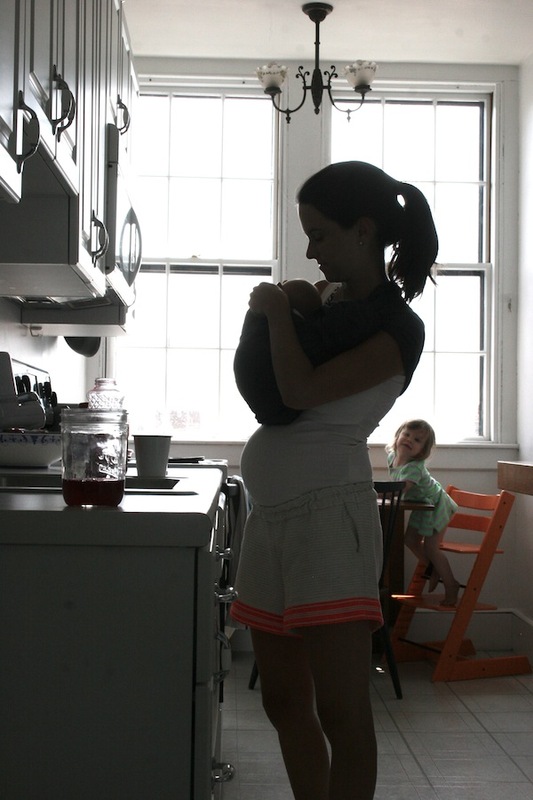 I have mentioned before that I like to imagine motherhood as the lazy summertime of a woman’s life. With Joan Bea’s arrival last week, again I encounter the bliss of a day less full, a project not started, a voyage left for another time. We all have voices within us that speak louder and even compete at times: the creative urge, the rowdy adventuring spirit, the maternal leaning, the enthusiasm and passion of a new idea, the quiet tug to rest and be still. I am happy to tell you that it is significantly easier with the second baby to relax and enjoy, to listen to the voice that says cherish, relish, savor. I know Boston’s isn’t the only city anticipating a heat index over 100 today and tomorrow. Let’s all have a tall glass of water and savor the breeze when you discover it. I’m so grateful for this project from Sakura Bloom–I fear that many of these moments would not have been captured without it! 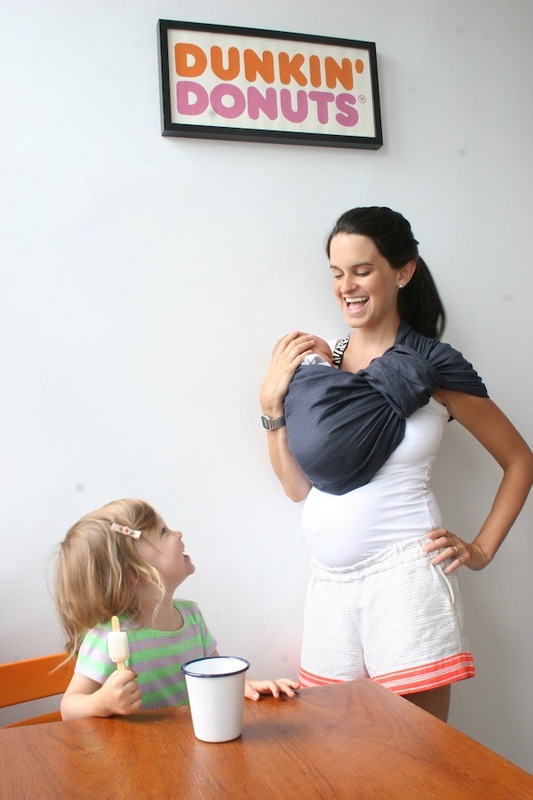 I’m wearing the Sakura Bloom pure baby linen sling in twilight. 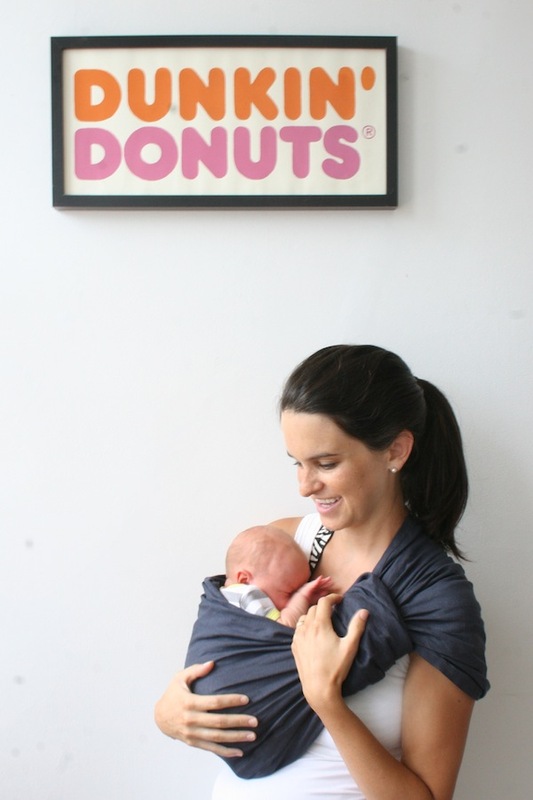 This entry was posted in Baby, Boston, Sling Diaries and tagged newborn, sakura bloom, sling diaries by Rachael. Bookmark the permalink. Love this so much. That second picture where Lux is looking up at you smiling? That one is my fave. Such joy! Welcome baby Joan Bea! Welcome to your wonderful family! Welcome to the world Joan Bea!! 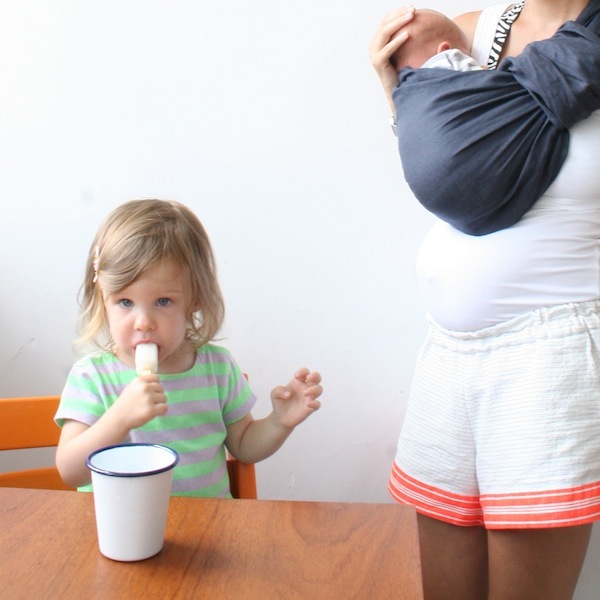 Gorgeous photos and I totally agree its much easier to relax with your second little one. Stay cool ladies! i’m in love with the first and second picture. frame? also, the words–i so remember trudging through a balmy nbpt evening the night my water broke. those july babies…. That little anecdote makes me want to revisit your birth story. beautiful images (both the photographs and your writing)! Thank you! it’s so crazy to me how frequently people have kids at the same time, spaced by years. 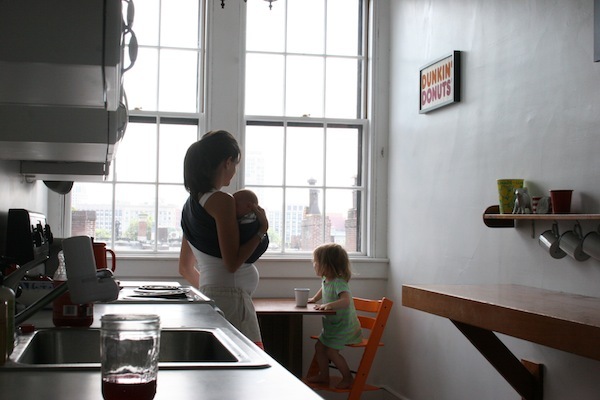 I love our kitchen too–it’s my favorite part of our new apartment. Though this week it is sweltering because of all the sunshine. I’m a July baby and wouldn’t mind having one of my own. (I have an April one now – which is a lovely time to have a babe, if you ask me) Anyway! Congratulations on your sweet little Joan and happy belated birthday to sweet little Lux. How’s the transition going form one to two? I’ve heard it can be the trickiest of all. Do tell sometime! Could u possibly do a video on how u sling? Your wearing always looks so perfect as does the knot you tie the tail?! Hmm, I could try to do one, but in the meantime, I’d encourage you to just experiment! Truly it gets easier every time. And sometimes it probably looks better on the outside than it does to you. The more I mess around, the more I learn. I don’t knot the tail, I just wrap it around the rings. Couldn’t be easier! What a perfect post…the perfect thing I needed to read today as I sit and rest on the couch with an infection. After Boden was born just 10 days ago, I had so many voices in my head vying for my attention and action- go, do, explore, share, see- and those voices won over the other quite urge from my body- stay, rest, be, savor, enjoy. Now, as I am confined to the couch for 24 hours, I have the option to choose either frustrated and self-pity or savoring and relishing this mini “summertime of my life” as you put it. I think I’ll choose the latter. Thanks for the suggestion 🙂 Oh, and congratulations on the arrival of Joan Bea! I can’t wait to meet her. oooh poor thing. Did you get mastitis? That always seems to pop up for the busy mama. I don’t know what it is with first babies–there is SUCH an urge to do. Maybe it’s that you want to share your new one with the world? It’s a mystery. Glad you’ve been forced to settle down a little bit. The time that you can watch a tv show while you nursing, or nap alongside, or take them to a baby-friendly movie showing, etc, is surprisingly short. Live it up (in an indulgent way)! congratulations!! where are those shorts from? They are awesome! !